Together with our partners the Museum of the City of New York and ARCHIVE Global: Architecture for Health, “Garbage and the City” presents three moments in the city’s battle with sanitation and waste disposal challenges in a rapidly growing urban environment. Catherine McNeur will set the scene with “Hog Wash, Swill Milk, & the Politics of Waste Recycling in Antebellum Manhattan” on July 1. Julie Sze will discuss “Noxious New York: Race, Class and Garbage” on August 3, and finally, Robin Nagle, anthropologist-in-residence for New York City’s Department of Sanitation, will consider the daily practice of garbage collection and management in the city today with “Life Along the Curb: Inside the Department of Sanitation of New York” on August 17. All three events are free with advance registration. New York City garbage truck, circa 1929. Photo from The New York Academy of Medicine Committee on Public Health Archive. The Academy has a long history tackling questions related to New York City’s sanitation infrastructure. Waste management and disposal was an ongoing concern as the city grew. Despite the creation of the Department of Street Cleaning in 1881, street cleaning and garbage removal contracts, like many other services enmeshed in the politics of city, included the trading of political favors, jobs for constituents, and the creation of slush funds. The threat or occurrence of epidemic disease triggered attempts to improve the situation, but at the turn of the 20th century, sanitation and waste disposal efforts remained haphazard and slow to change. Many sanitation advocates of the late 19th century blamed disease on filth and refuse and the foul-smelling miasmas they produced. The emergence of new bacterial theories and techniques linked disease to the presence of specific pathogens. 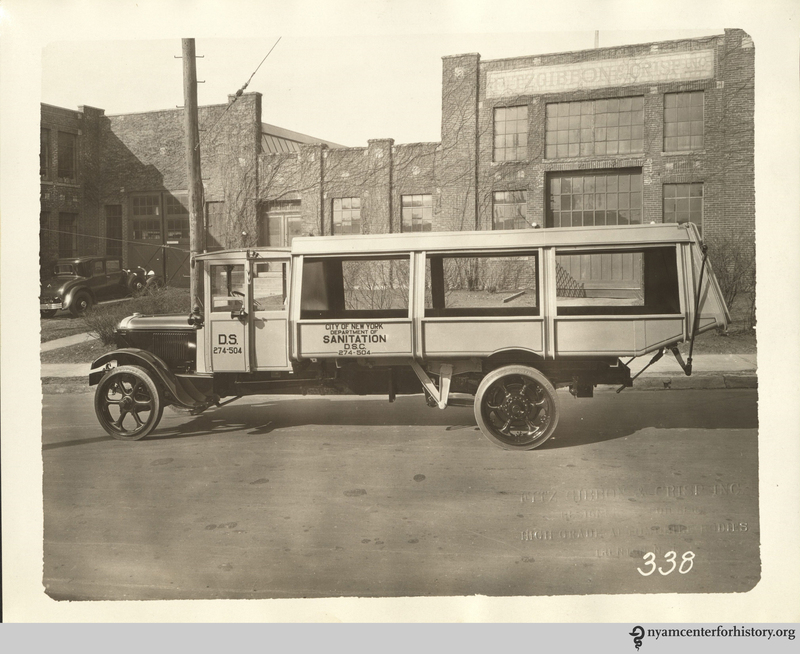 Whichever approach to disease was taken, the reality was clear: keeping the city clean from refuse was critical to minimizing the spread of infectious diseases such as cholera, making dealing with garbage a critical issue for the health of the city. An open letter to mothers from the Committee of Twenty. Click to enlarge. Pamphlets reflecting the work of George Soper and the Committee of Twenty. In the 1930s, George Soper, the sanitation engineer best known for identifying Mary Mallon (“Typhoid Mary”) as a carrier of typhoid,2 was sent by the Committee of Twenty to take a trash tour of Europe. He attended the 1931 International Conference on Public Cleansing in London; measured the plowing capacity of German snow trucks; visited 14 incineration plants; and documented varied street sweeping methods during his extensive travels. The evidence he brought back all pointed in the same direction: whatever its successes, New York City was behind the times when it came to dealing with trash. 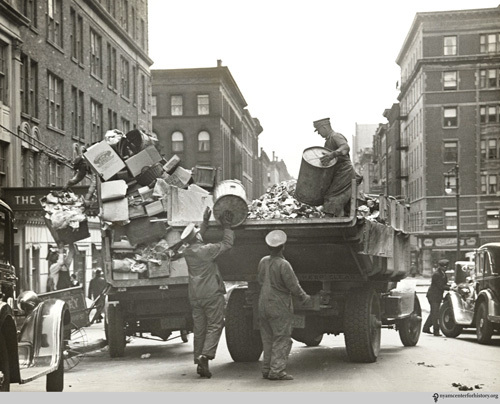 The Academy used Soper’s reports to urge significant changes in the infrastructure of New York City’s garbage collection and disposal. Street cleaning in Nuremberg. 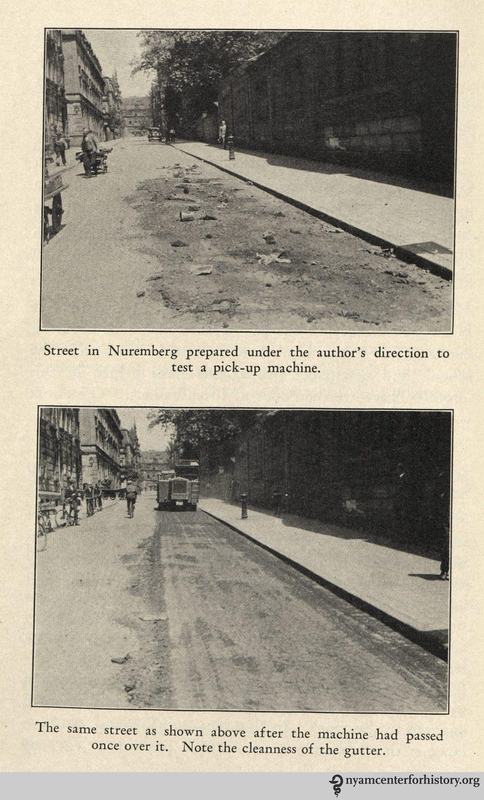 In Soper, Further Studies of European Methods of Street Cleaning and Refuse Disposal, with Suggestion for New York, 1930. By 1933, politics struck again. The Committee chairman’s report stated that “the activities of the Committee of Twenty were considerably curtailed by the unexpected changes in City administration.”3 The Committee bemoaned the fact that despite better cooperation between the Police and Sanitation Departments, new ordinances and regulations were not systematically followed, and the “streets of New York City remain an untidy, if not disgraceful, condition.”4 Despite their concerns, the Committee concluded that the combination of political change and worsening economic conditions meant their attention would be better directed towards other efforts at a national level. On a more positive note, the 1930s saw considerable resources expended, partly through New Deal projects, building new sanitation infrastructure, particularly sewage treatment.5 A 1934 law curtailed the dumping of municipal waste at sea, beginning a new era of sanitary landfills.6 Throughout the decade the Department of Sanitation (renamed from the Department of Street Cleaning in 1929) introduced new mass-produced garbage truck able to better compact and transport garbage. The winning entrant of the Committee’s competition for a more effective trash basket however, has sadly been lost to time. New York City garbage truck, circa 1930. Photo from the New York Academy of Medicine Committee on Public Health Archive. The “Garbage and the City” series is presented in collaboration with the Museum of the City of New York and ARCHIVE GLOBAL and is supported by a grant from the New York Council for the Humanities. Any views, findings, conclusions or recommendations expressed in this program do not necessarily represent those of the National Endowment for the Humanities. 1. Committee of Twenty on Street and Outdoor Cleanliness, Committee on Public Health Archive, New York Academy of Medicine. 2. George A. Soper, “The Curious Career of Typhoid Mary,” Bulletin of The New York Academy of Medicine, 1939 Oct; 15(10): 698–712. 3. Presumably a reference to Mayor John O’Brien, who served a one year term in 1933 before being defeated by Fiorello LaGuardia. O’Brien is now regarded as the last of the “Tammany Hall” mayors, criticized for his lackluster response to the impact of the Depression on the New York population. See: “Mayor John O’Brien: His Heart Is As Black As Yours!” Bowery Boys blog, February 25, 2010. 4. Report of the Chairman at the meeting of March 23, 1933, Committee of 20 on Street and Outdoor Cleanliness, New York Academy of Medicine Archives. 5. 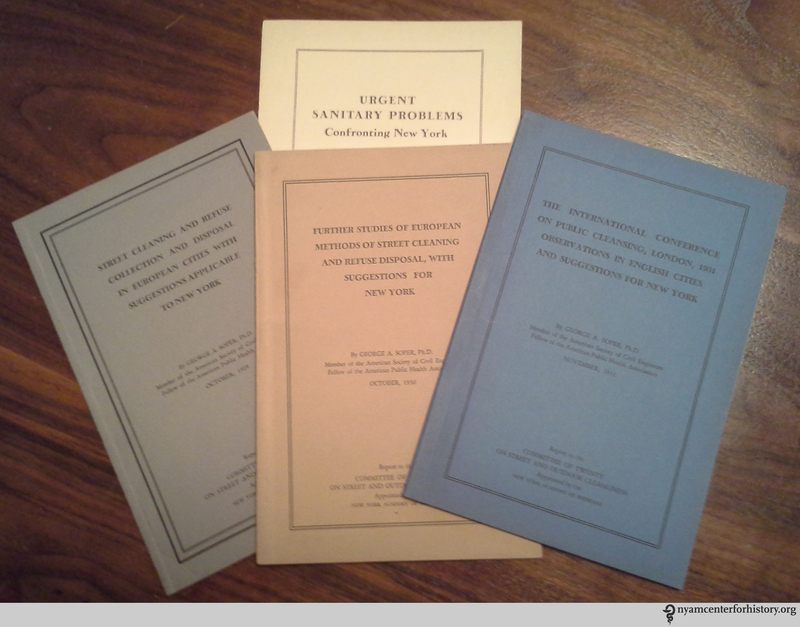 John Duffy, A History of Public Health in New York City 1866-1966 (Russell Sage Foundation: New York, 1968), 521. 6. George S. Soper, “Disposal of waste an urgent problem: Supreme Court order against dumping at sea points the need for incinerators,” The New York Times, March 18, 1934. 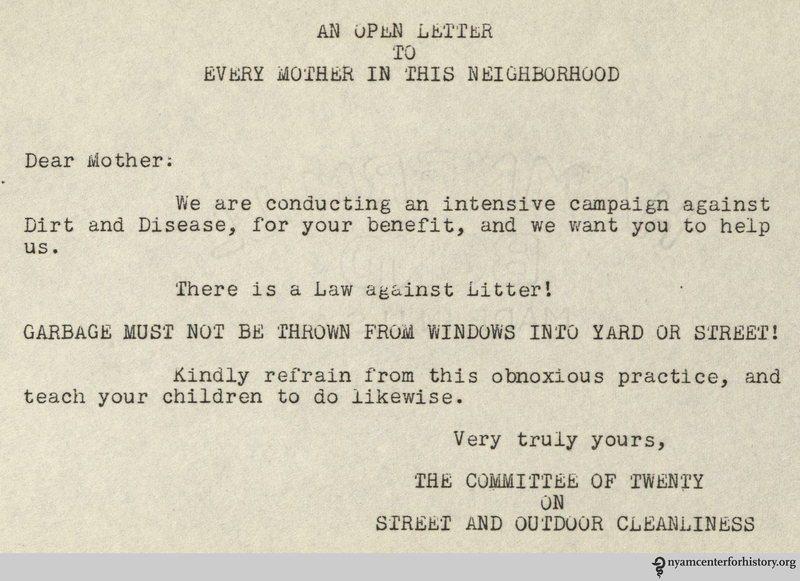 This entry was posted in Collections, Events, History of medicine and tagged Committee of Twenty, garbage, Garbage and the City, George Soper, sanitation, street cleaning, waste, waste disposal by nyamhistorymed. Bookmark the permalink.